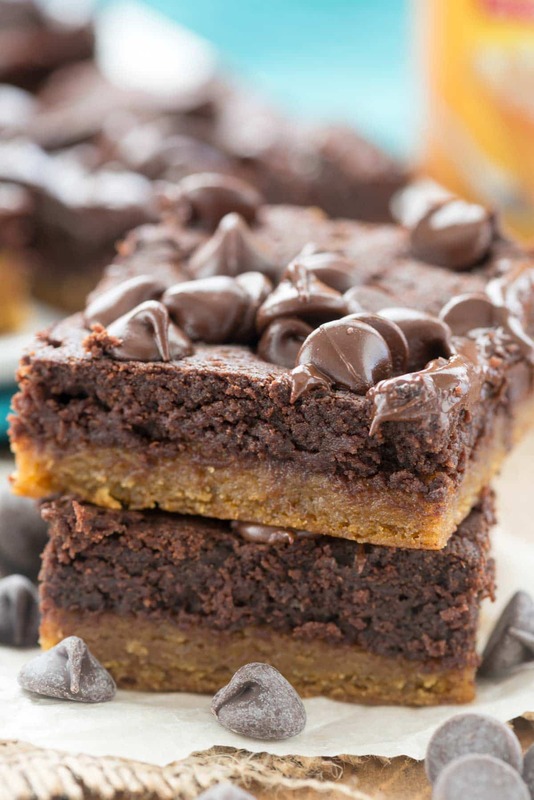 When you want a pumpkin cookie and a brownie together, you want a FUDGY Pumpkin BROOKIE!! Okay, so, um, I’m totally embarrassed. It’s now 7:08am on Sunday morning. This post posted at 3am…WITH NO CONTENT except photos and the recipe. I put it all in earlier this week, scheduled it, and planned to come back and write it. AND THEN I FORGOT TO WRITE THE POST. So now it’s been out in the world for 4 hours and is in all the feeds everywhere WITH NO WORDS. !!!!!! Last week I wanted to make something pumpkin and something chocolate. 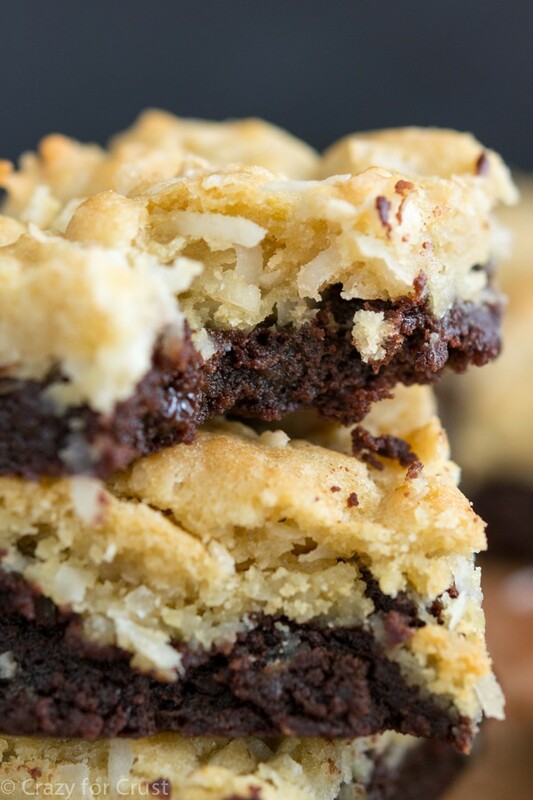 I love brookies – I make them all the time. Coconut, Mint, Oatmeal – and now I’ve made them pumpkin! The recipe starts with my favorite pumpkin cookie recipe that I pressed into the bottom of a 9×13″ pan. It took me several tries last year to perfect this recipe and I love it – expect to see it lots more times this year! Then I used my standby brownie recipe on top, and topped it with chocolate chips. 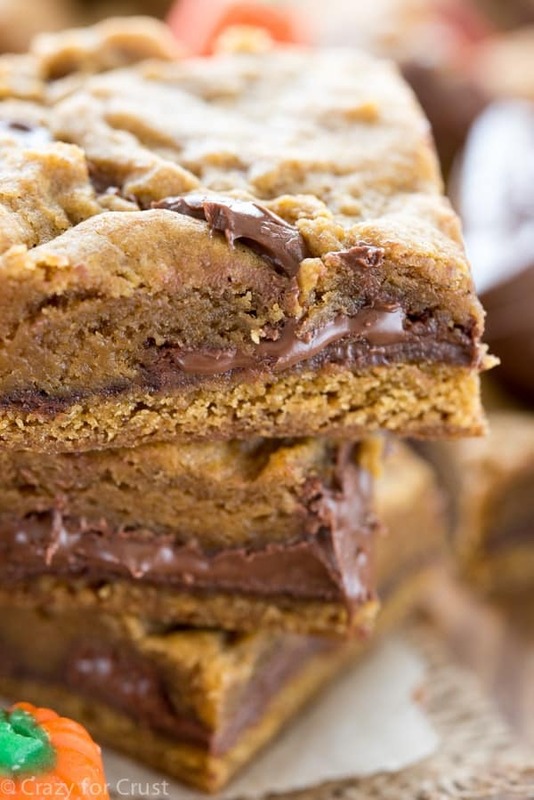 Bake and you have the PERFECT brookie for fall. I had to get these out of the house ASAP because I ate two of them without even thinking, that’s how good they are! I still can’t believe I forgot to write about it! 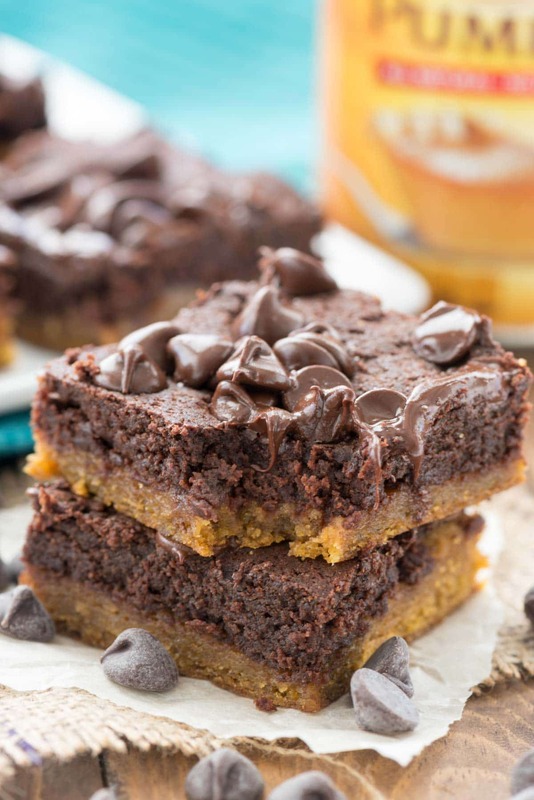 These easy and oh so fudgy Pumpkin Brookies have a pumpkin cookie bar layer topped with gooey fudgy chocolate brownies! 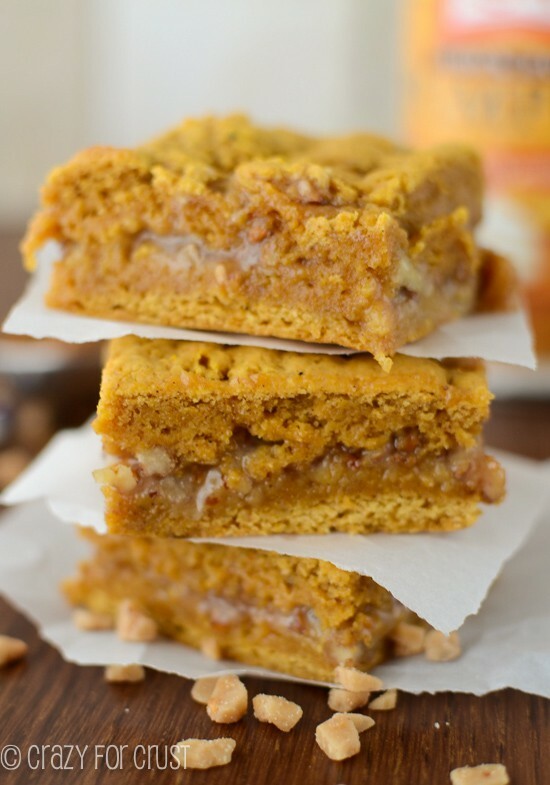 The perfect fall cookie bar! Preheat oven to 350°F. Line a 9x13” pan with foil and spray with nonstick cooking spray. Place melted butter, pumpkin puree, brown sugar, and granulated sugar in the bowl of a strand mixer fitted with the paddle attachment. (You can also use a hand mixer.) Mix until combined. Continue mixing and add the egg yolk and vanilla extract. Add the baking soda, nutmeg, cinnamon, ginger, and allspice and mix until combined, scraping the sides of the bowl as needed. Slowly mix in flour until a smooth dough forms. Press dough evenly into the bottom of the pan. If you’re using a brownie mix, prepare as directed on the box. Set aside. If you’re making from scratch brownies: Place the baking chocolate and butter in a large, microwave safe bowl. Heat on HIGH power for 2-3 minutes, stirring every 30 seconds, until chocolate is smooth. Stir in sugar. Add eggs, vanilla, and cocoa and stir well. Add flour and stir carefully. Pour the brownie batter over the cookie layer and spread evenly. Sprinkle the top with chocolate chips. Bake for 25-35 minutes until the of the brownies look set. The toothpick test in the center will come out with some crumbs on the toothpick. Cool before slicing into bars. Pumpkin. Brownies. Cookies. How could one possible go wrong, here?! These look stupid crazy amazing. Cannot wait to try them! I can’t even! These must be amazing! Thanks DOROTHY! you always make my weekend awesome. can’t wait to try it. Yes!!!! Finally a lady that I can follow. You rock! These made me a hit at office parties.